NRN has a simple geometry model for road segments and junctions. Road segments are split between junctions where there are attribute changes, and those segments carry the same National ID. A strategy to build a national road dataset was envisaged in Canada in the 1990s. The initial goal was to build a simple framework dataset with accurate geometry and basic attributes to support topographic mapping, but the vision also included the ability for partners to extend and enhance the base data to support numerous application needs. The National Road Network (NRN) program was defined by Natural Resources Canada, the national mapping organization in Canada, in partnership with federal, provincial, local, and aboriginal partners to provide this freely available road information. Currently, datasets can be downloaded in shapefile and GML formats by province/territory for the entire country at www.geobase.ca. National Road Network GML data in ArcGIS Desktop for a portion of the Yukon Territory. The initial data capture for the entire country is complete, and the focus of the program has shifted to establishing data update programs with partners. Significant work is under way, and the goal is to deliver updates from 10 of the 13 provinces and territories this year. At the heart of NRN is a simple geometric data model and identification scheme. A road segment connects two road junctions, and a junction is placed at every point where there is a physical (not necessarily legal) turning option. The geometric model follows the ISO Geographic Data Files (GDF) standard. Along with the spatial model, unique National Identifiers (NIDs) are assigned to features and junctions. 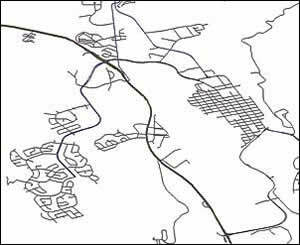 Early in the design process, a more elaborate system for storing attribute information along road segments was defined, but at this point, a simpler segmented model has been implemented with a set of standard attributes stored directly on each feature. 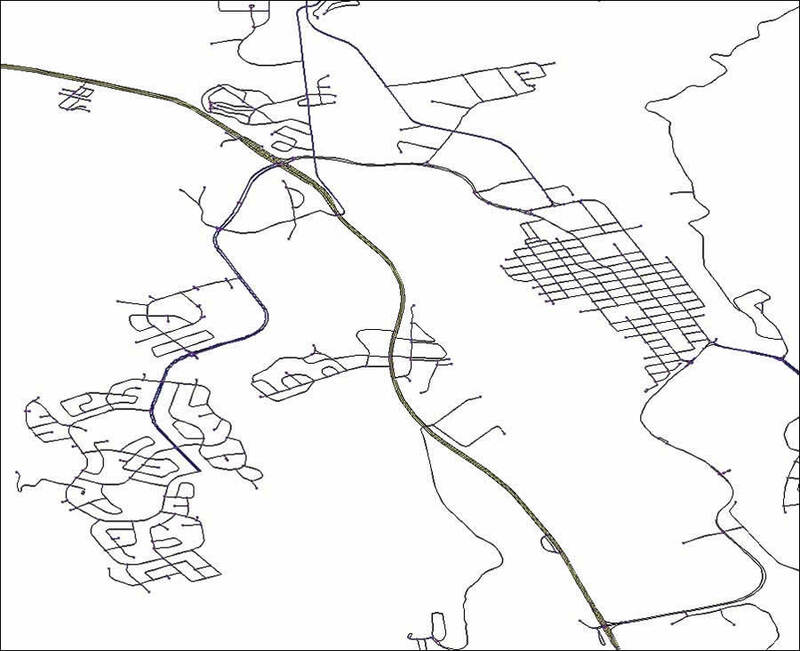 As a result, roads are split between junctions where there are changes in attribute values (see figures above right). Each organization can add its own information to the base data and can generate specific views/products according to its needs. Due to the high accuracy standards and the consistent National Identification Scheme, users can reliably link their own data to the national framework across product releases. Delta/Change files are also provided with every new release, easing integration and change management processes. Prototype using geodatabase replication for NRN data. As the data maintenance program is maturing, Statistics Canada and Elections Canada are in the process of moving to the NRN geometry to define census and political boundaries. These two organizations share a common geographic database and provide a significant amount of national-level information to partners and to the public. Other federal and provincial partners are also making plans to use NRN. NRN is becoming an important spatial backbone that will facilitate data sharing and data integration between partners in the future. An important part of the update cycle is getting "observation control"feedback mechanisms for data quality enhancementsembedded into the update process. This involves a move toward two-way data-sharing methods so that end users can communicate change requests to data owners. This current implementation of observation control tools can be viewed on the GeoBase portal. Beyond the current data management program, Statistics Canada is prototyping the use of off-the-shelf replication tools to share data between partner organizations. While it is not realistic to expect that all partner organizations would use the same data models and software, there are some steps that can be automated to reduce the reliance on relatively costly extraction, transformation, and loading (ETL) processes. The opportunity involves replication from partner nodes in provinces to a national warehouse/clearinghouse. The NRN initiative presents a number of technical design and partnership models that define the state of the art for road spatial data infrastructure. For more information, contact Steve Gris�, Esri (e-mail: sgrise@esri.com). For more information on the National Road Network program and data, visit www.geobase.ca.